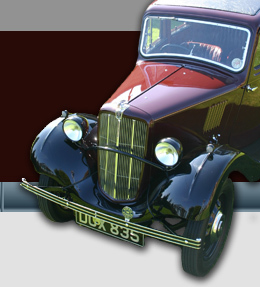 On March 25th 1938 Miss Annie Gumbley drove her 1934 Austin Seven saloon AOH 96 to Smith's Garage Bournville (yes the suburb of Birmingham with world famed chocolate connections!) to trade it in against a new Morris. Paying the balance of £88 5s 10d cash, and with the receipt signed over a 2d stamp, she took delivery of DOX 835 a smart new maroon Morris Eight Series II 4-door saloon with sliding head and aluminium number plates. The list price on the Invoice was £149 0s 0d plus £1 1s 4d delivery, plus a hefty extra of £1 0s 0d for those smart plates. An hours run around Bournville with the garage proprietor completed the transaction, and she returned to 14 Thorn Road. All servicing was carried out by her brother, but any repairs were usually dealt with at Wards Garage in Oak Tree Lane where the car was garaged each night. During the 1950's the engine was rebored, new shock absorbers were fitted and the lighting upgraded. One incident on the road marred an otherwise good record; in the 1960's a rear wheel/half shaft/hub assembly started to part company with the rest of the car due to an incorrectly fitted tab washer after servicing the brakes. Current users who do their own repairs beware! In 1966, at a mileage of just over 68000, Mrs Farman decided to stop driving and reluctantly to sell the old Morris. This was where I came into the picture. 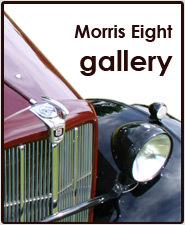 John Handford, a colleague of my father, contacted me to say that the aforementioned Mrs Annie Farman, the elderly aunt of his wife Christine, had regretfully decided to part with her 1938 Morris Eight DOX 835. As she had owned this car from new, she was concerned that it went to a good home as it did need some care. In October 1966 I was taken for a spin in the car by Mrs Farman, and I purchased it on the spot for £25. For some reason I recall being surprised by the peeling chrome on the gear lever and the almost 'matt' paintwork, but somehow it cried out for help. I had bought my first car! The car had done 68500 miles from new in 28 years and was completely unspoilt and original. However it’s maroon paintwork had become very dull, and it’s wings were going rather rusty. But it did have an MOT certificate, it ran very well, and it’s back seat was still ‘mint’ beneath the cloth cover! After a good clean inside and out, a cut and polish and a bit of filler and paint on the wings, it looked very smart indeed. Subsequently I carried out various jobs and adjustments and used it as my everyday transport for the next two years, adding a further 15000 miles. The car proved reliable and never let me down on the road. I joined what was then called ‘The Morris Eight Tourer Club’, and the first club event that Dox attended was on Sunday 31st June 1968 when I turned up at the Spring Driving Test event at Cromford in Derbyshire. I even drove the car around Silverstone circuit later that year after a race meeting! In September 1968, something strange must have happened to me because I decided to sell the car and to get a 1964 Hillman Imp 695 MOK instead. What was going on? I received £110, and I very clearly remember thinking what a terrible mistake I had made as it drove off into the distance for the last time. One item that I kept as a memento was the enamelled badge from Smith’s Garage Bournville which had always been on the dashboard. So that was the last I would see of DOX 835………….or was it? 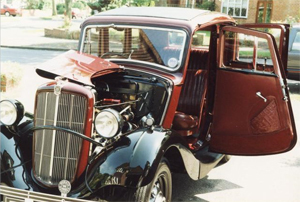 I restored this car myself, with the exception of welding, engine machining, radiator recoring, rear wing manufacture and paintwork which were all dealt with by specialist firms. I would like to have attempted the paintwork, but frankly had I done so there was a great risk that the car would never have been finished. On and off, it took 23 years! But of course there were many gaps in proceedings and in fact the main concentrated effort was from 1995 to 1999. 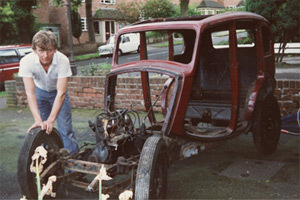 One good thing about the Morris Eight is that it is quite small, easily dismantled and easy to manhandle. Both the chassis and the body can be moved by two people, and the engine is fairly light too. I saved and sympathetically restored everything that could be re-used. Detailed notes/sketches/photographs/labels were used to record all items as they were dismantled to enable correct and authentic reassembly as originally carried out on the assembly line in 1938. You will not be surprised to hear that because of all this I can recall in minute detail virtually everything to do with this car. To view more photos of the restoration process click here.